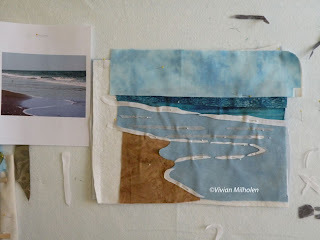 This is part II of how I create my art quilts. As you read in yesterday's post, I now have it pinned to the wall. Since my iron is close to my design wall, I can gently fuse any of the fusible pieces while it is still on the design wall. (My design wall is insulation foam covered with cotton batting.) I only "touch lightly" with the iron as I don't know if it will melt or not. I pin the rest of the pieces. I don't want it fused too much as I am still tweaking as I go. 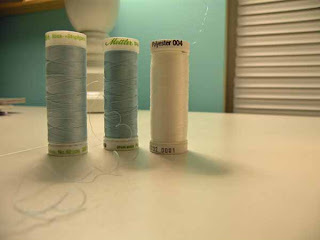 The thread I chose for this particular series of quilts is Mettler No. 60 and Sulky invisible polyester. Both are thin and blend easily into the fabric. 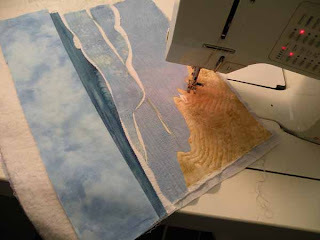 I use a combination of free motion and regular machine stitching. I also have wonderful light in my studio both from the windows and the energy efficient bulbs in my lamps. (I will have to blog about these daylight bulbs that are magnificent!) Then I quilt happily until I like it. As you can see below, the quilting is mostly finished. Now I will pin it back on the design wall and tweak it some more. If I don't like the quilting in a certain part I will remove it and quilt it again. I will probably add some shading, shadows and highlights using thread, paint and/or chalks. These will most likely be matted and framed. I would love to hear your comments about your creative process or a link to your tutorial. 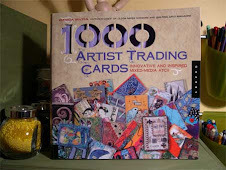 Below is a description of how I usually create my art quilts. I will try to do this in two parts. I like to start with one of my own photos. This one is a bit dark, but for creating an art quilt, it will do just fine. I print it out on plain paper and pin it to my design wall. (See the photo in yesterday's blog post.) I then think about size. Since these quilts are relatively small, 12" x 16", I first dig through my fabric scraps. I like to use a mix of my hand dyed fabric and commercial fabric. 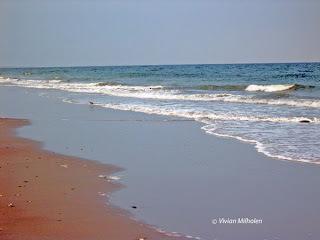 I'm not trying to match the colors to the photos, but rather for me, a feeling of beach and ocean colors. This could mean brighter colors to some artists. This is where you have to go with the "wow, I like this color" feelings. 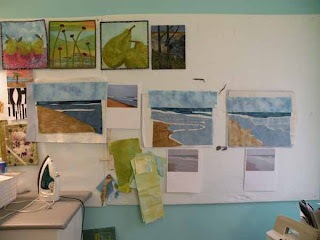 I then pin the fabric pieces to my design wall. I add or throw out some of the pieces as I go. Sometimes they start to fall off the wall but at least they are in one pile. 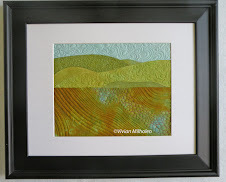 I cut the backing and batting larger than my finished art piece and layer them and pin to the design wall. Then, I make a sketch by just looking at the photo. When I like the general sketch, I trace over my pencil lines with a Sharpie pen. 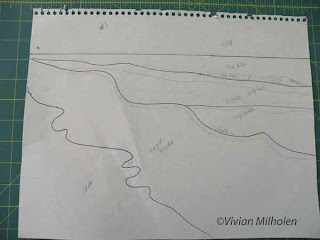 If I want to keep it this size, then I use this for a pattern. If I want to make it larger, I trace it to transparency film and use my overhead projector. 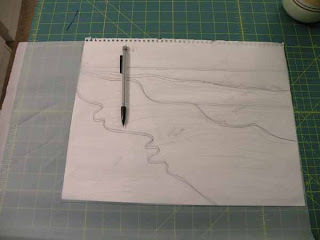 I would then have to trace it to a larger size paper. Now that I have the pattern sheet to the size I want, I place it on a light box. At this point, some of my pieces will have Wonder-Under applied and some will not. I place the Wonder-Under (lite) over the pattern and trace. I then iron it to the fabric and cut it out. Then, I pin to the wall and keep tweaking until I have the "first draft" of my art piece. Everything is pinned in place. At this point, I let it sit for a bit while I do other things (like laundry, ugh!). I keep taking a peek at it though and may tweak it more for composition. 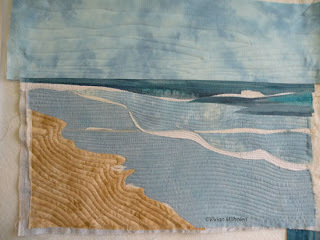 Tomorrow, I will describe the quilting and more of the tweaking process, so stay tuned! Happy New Year to all!! 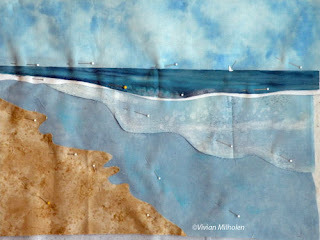 I have a new resolution to make more art and blog about it! Thanks to all of you who do read my blog. I recently joined the SAQA Visioning project which I think will be a great learning experience for me. It's time to quit procrastinating and make more art and enter more shows. 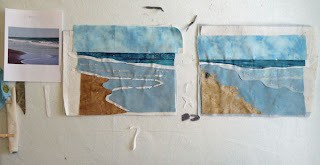 The two works-in-progress above are beginnings from two sketches I did inspired by my photographs of the beach. It's a new series! I actually have a third one on the design wall which isn't in this picture. I'm still tweaking them before any quilting begins. As you can see, there are fabric "guts" stuck to the design wall waiting to be used or tossed. Tomorrow, I will post about my process. Just wanted to get started on the blog posting today.